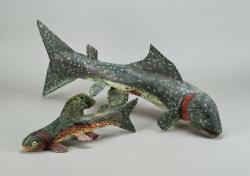 During the Work Progress Administration (WPA) period of the 1930’s, the traditional arts of the region gained resurgence through federal programmed that trained and employed New Mexican folk artists, In 1936, Patrocino Barela’s expressionistic woodcarvings created under the auspices of the Federal Arts Project were a part of New Horizons in American Art at the Museum of Modern Art in New York. The wood carving tradition continued into the 1960’s primarily for the tourist trade with classic carvings of burros and oxen drawn carts. 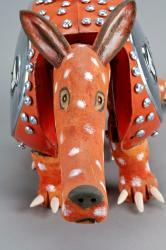 During this time artists started experimenting with recycled materials and common household paint. The decade of the 1970’s was a dramatic period that fostered the powerful animistic forms of Felipe Archuleta and his workshop of carvers. 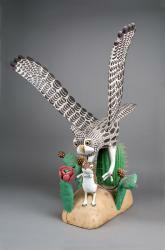 By the 1980’s Archuleta’s animal sculptures were highly sought after by collectors and curators. His menagerie of domestic and exotic animals made their way to museum exhibits in New York, Paris and Tokyo. This exhibition celebrated the rich Hispano folk tradition of animal wood carving in New Mexico and the continued influence on the national and international scene. 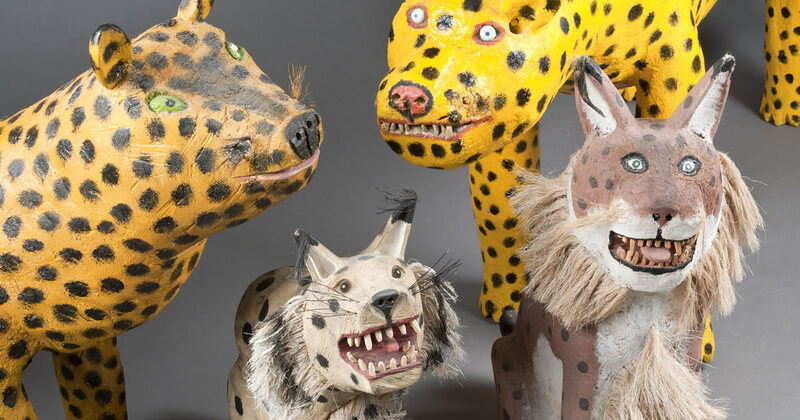 The exhibition highlighted the historic roots of New Mexican woodcarvers, offering early twentieth century examples of whimsical animals including works by Jose Dolores Lopez and Celso Gallegos. 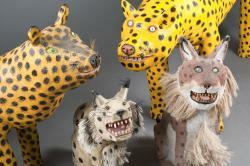 The excitement around the workshops of the New Mexican animal carvers created an insatiable market that spurred on innovations by Alonso Jimenez, Jim Davila, David Alvarez and Leroy Ortega. This generation of carvers fostered the iconic images of friendly burros, howling coyotes, and Technicolor rattlesnakes, reaching deep into the popular culture of the Southwestern United States. 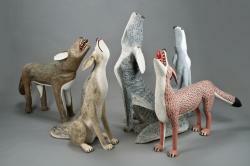 These animal sculptures have become emblematic of Santa Fe’s cultural character. The Museum of International Folk Art gratefully acknowledges the following donors for their support: The International Folk art Foundation, The Museum of New Mexico Foundation, Newman’s Own Foundation and the Museum of New Mexico Exhibitions Development Fund.